In anger I threw my pager across the on-call room, slamming it against the wall. I don’t anger easily or often, but I was a pediatric resident who had been awake for 36 hours. The pager had gone off one time too many. Sleep deprivation had changed me from a calm, caring person into an irritable, impulsive mess. As if it shouldn’t have been obvious, research has shown that the sleep deprivation associated with residents’ on-call schedules brings about significant “impairment of physician mood” as the sleep deprivation increases (Journal of Occupational Medicine, Dec 1992). The surprising news is that partial, or low-level, sleep deprivation has a bigger effect on behavior than either the short or long-term complete sleep deprivation experienced by residents (Sleep, May 1996). Until recently, the effects of partial sleep deprivation have been seriously underestimated. We know, based on common sense, that inadequate sleep makes kids more moody, more impulsive, and less able to concentrate. We’ve known for more than 20 years that sleep deprivation makes it difficult to learn (Journal of Experimental Psychology, Mar 1975). Recent research has verified that chronic poor sleep results in daytime tiredness, difficulties with focused attention, low threshold to express negative emotion (irritability and easy frustration), and difficulty modulating impulses and emotions (Seminars in Pediatric Neurology, Mar 1996). These are the same symptoms that can earn kids the diagnosis of attention deficit hyperactivity disorder (ADHD, popularly known as ADD). ADD is an important problem in its own right, but research in sleep laboratories has shown that some (and perhaps a great many) kids are mislabeled with ADD when the real problem is chronic, partial sleep deprivation. Sometimes it is obvious to parents that their children are not sleeping well — but not always! Any child who snores may not be getting adequate sleep. Obstructive sleep apnea is a common medical condition that is now being identified in more and more children. The peak age for this is 2 to 5 years old, but it can occur at any age. Not all kids who snore have sleep apnea. Classically, those with sleep apnea snore quite loudly for a bit, then are silent, then snort briefly, move about, and resume snoring. If snoring is accompanied by nighttime breathing difficulty and pauses in breathing, then it may well be sleep apnea. This should be brought to the attention of your pediatrician. You might want to make a cassette tape of your child’s sleep noises to bring with you. Children with sleep apnea do not get sound sleep. They may also get suboptimal oxygen to the brain at night. Obstructive sleep apnea can have a serious negative impact on a child’s intellect and behavior. The common symptoms of sleep apnea are difficulty paying attention during the day, decreased academic performance, oppositional behavior, and restlessness. Not all kids with sleep apnea snore. Even when they do, sleep apnea is often overlooked. Instead, the child is diagnosed with a behavioral disorder — most commonly ADD (Journal of Clinical Child Psychology, Sep 1997). Children with sleepwalking, restless leg syndrome, narcolepsy, insomnia, or other sleep problems may also be misdiagnosed with ADD (Neurology, Jan 1996). In an individual child, it can be very difficult to tease apart whether interrupted sleep is the cause or the result of ADD. The good news is that even when ADD is the correct diagnosis, addressing the sleep issues can dramatically improve the behavior of the child (Journal of Pediatric Psychology, Apr 1991). A 10-year-old girl in Pittsburgh, Pennsylvania who had true ADD also had significant sleep difficulties. She had long delays before falling asleep. She would often wake up at night and have difficulty falling back asleep. She received professional help for her sleep problem (chronotherapy combined with a behavior modification program), which resulted in an increase of sleep from 7.2 to 9.2 hours per night. There was significant, measurable improvement in her schoolwork, teacher evaluations, and behavior. These changes were observed by teachers and peers who were not aware of her treatment. 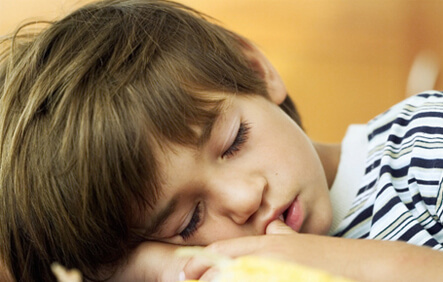 If your child has ADD symptoms or other behavior problems, he or she should be carefully assessed for sleep problems. If sleep disturbances are present, they need to be addressed, regardless of whether or not they are the root cause. If your child is not getting sound, uninterrupted sleep, discuss this with your pediatrician. You may also want to contact the National Sleep Foundation (202 785-2300) or the American Sleep Disorders Association (507 287-6006) for information or referrals. There are now more than 3,000 Sleep Disorders Centers that can provide the kind of help the little girl from Pittsburgh received. Another great resource is Helping Your Child Sleep Through the Night, by Joanne Cuthbertson and Susie Schevill. How do we know how much sleep our children need? First and foremost, every child is different. In general, toddlers and preschoolers sleep approximately 12 hours per day with one nap. School-age children need less, about 10 hours per day. Most preteens and teens need around 9 hours of sleep per day – though we all know that many teens get much less! These are just averages! Some children need much more sleep than these numbers, other much less. Many sleep experts recommend asking yourself some questions to determine if your child is getting too little sleep. Does your child seem sleepy or irritable during the day? Does your child have difficulty staying awake when sitting still? Does your child have trouble paying attention at school or at home? Does your child seem to perform below his or her potential? Does your child have emotional outbursts? My almost 5 year old grandson, is undoubtedly hyperactive (it is hereditary). But, it does not matter how much sleep he gets a lot or a little, he not only has the ADHD symptoms but he as recent, became violent to everyone at home. He will tantrum so horribly that he punches, slaps, pinches, bites, etc.. to the point of bruise marking and even draws blood from his family members. I have no say, is the raising of him, but if I did have it my way, he would be put in a hospital for serious evaluation, and medicated not being allowed to come home until he is under control. I read your article, it was nice experience for me. It is important to manage frustration and anger so that you can enjoy parenting and maintain a safe, happy home for your child. My toddler is 4 and she keeps waking up in the night trying to lay on me or wanting juice. She always wants to be on me or by me and she dont want no one else by me. Her sleeps in interupted a couple of times at night and disobeys my intructions. She likes to argue back or throw tantrums alot and wont go to sleep unless im with her. I can move but she will try to lay on me at night. She really is my grand baby and i had her since she was 5weeks old when her mother passed. She was laying in her mothers arms when her mom pasted for a couple of hours. But she was only 5 weeks old could that have an effect on her she dont remember and im the only mother she knows and her (mothers, mother) she calls granny. What do you think about this? I am moved to tears by your comment / question. You’ve both been through so much. There is a lot for you both to work through and a lot to be thankful for — you have each other. Your granddaughter is so lucky to have you, and you are lucky to have her. Her constant need to be by you must be a horrible drain. Her tantrums have got to be exhausting. But if you can, look beyond the now and see how being in her life IS the connection to her mother. My son hasn’t picked up any words though he is 2.5 years old. Also, he doesnt pay attention when you speak to him or try to converse with him. He is physically growing well. When consulted the doctor here in India, they have mentioned that he has ADHD. I am worried and scared so much how he would be able to overcome his disorder and able to speak. Please advise. My 2.5 year old bangs his head on the floor or bed before he goes to sleep. If you yell at him to stop he does. My boyfriend insist there is something wrong with him. If it was crib banging he wouldn’t stop. Any suggestions? He sleeps at least 9 to 11 hours of un interrupted sleep a night. Sounds like it’s worth a discussion with your doctor. My nephew has the same head-banging behavior. In his case, it’s a form of self-stimulation/calming behavior associated with mild autism-spectrum (he’s a great kid, BTW). Not saying that’s the cause in your son’s case, and there may well be other possible causes (maybe related to sensory integration?). I am not a doctor, just throwing out ideas.